The current Chain of Rocks Bridge is a bridge that currently runs over the St. Louis bypass canal. In order to allow trucks over 80,000 pounds, a new bridge was constructed parallel to the existing truss bridge. The name of the bridge is named after the reason for the original need for the canal bypass. Just to the north of the city, the river becomes very shallow and rocky. IDOT is the owner of the project, HDR was the designer, and Walsh was the general contractor. Originally, the new concrete span bridge was scheduled for 850 days until completion. This goal was still met despite difficulties, but premium wages were still needed. 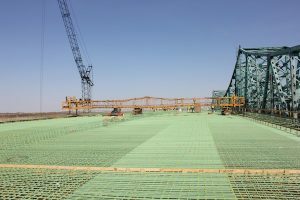 In terms of numbers, this project required 335,500 man-hours, 600,000+ CY of earthwork, 85,000 tons of aggregate, and 45,000 CY of concrete. We then talked to Brian Keller who was head of the excavation on the job. The project had a Casablanca drill with a 285 ft. max depth, with an average depth of 82 ft. for all of the drilled piers. All dirt work was subbed out to a local subcontractor, Petroff. Walsh determined that the risk involved with self-performing all of the dirt work would be too much risk. In order to excavate the cofferdam, an ice vibratory hammer had to be used to install sheet-piling barricade. Whalers used inside cofferdam were 24 in diameter cross supports and 36″ (web) wide flange beams. Cofferdams were excavated using long stick excavation and also a clamshell on crawler. For center span where a drill rig on a barge would impede barge traffic, track beams were used so drill rig can rest on beams and caissons can be drilled. 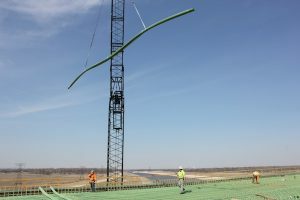 The longest casing used on the project was 144 ft. long. 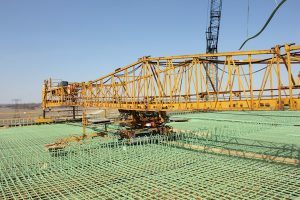 Polymer slurry was used to ensure that no foreign material affected the concrete pour. In order to drill through bedrock, a cluster drill under compressed air was used. Two cranes were used to pick up rebar cages to be set in the shafts. Concrete was pumped from bottom up of casing insuring all unwanted material got pumped out the top. The new roadways have a sewer system in-between the two lanes. For the approach, Petroff had to bring on all dirt to build up new lanes and then remove the pre-exisitng dirt approach. Part of the new approach required MSE (mechanically stabilized earth) walls to retain soil from the wetland buffer zone. The designed approach consisted of a foot of sub base, 4 inches of stabilized sub base, then an additional 6 inches of concrete on top of it. Lastly, asphalt pavement is placed on the concrete, which will be replaced as needed. A Gomaco 6300 w/auto float was used to pave the main potion of the bridge span. Concrete was hauled by regular truck for up to 30 min as well as a conventional concrete truck. Columns on this project were filled using a 3-cy. concrete bucket. The columns and their bases had to be poured with thermal cooling lines to prevent temperatures higher than 159 degrees. After the concrete has reached over 159 degrees or if the concrete become too cold there will be thermal cracking. Rebar cages for the piers weighed nearly 100,000 lbs each. A spreader bar was used to pick up these cages due to the flimsiness of the cages. 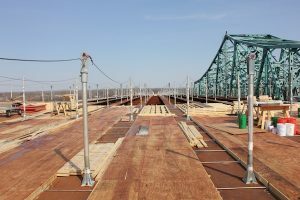 The bridge is scheduled to be traffic ready this summer, followed by the demolition of the existing truss bridge. 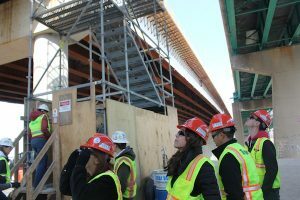 The total project is said to be completed by next fall.